There is nothing quite like the farmers market on a Sunday afternoon. One of my favorite go-to spots is the Studio City Farmers Market. Every time I am there, I am constantly reminded of when I lived in Aix-en-Provence in France before I embarked on my culinary journey. I shopped daily at the outdoor markets and built relationships with local farmers. The endless possibilities of what I could create with the fresh, local ingredients sparked my interest of becoming a chef, which eventually led me to pursue my passion and turn it into a career. It brings me much excitement to share my insights of cooking and my culinary creations with you in hopes of inspiring you to use locally-sourced ingredients, support local farmers, get creative in the kitchen, and entertain your friends and family! One of my favorite days of the week is Sunday. When Sunday rolls around, I head to the farmers market. Going from stand to stand, I can easily see what local ingredients are in season, gain inspiration for new dishes, build relationships with local, organic farmers, and bump into friends, old and new. Every Sunday, I bring an empty box along with me on my journey through the market to gather produce and ignite inspiration. 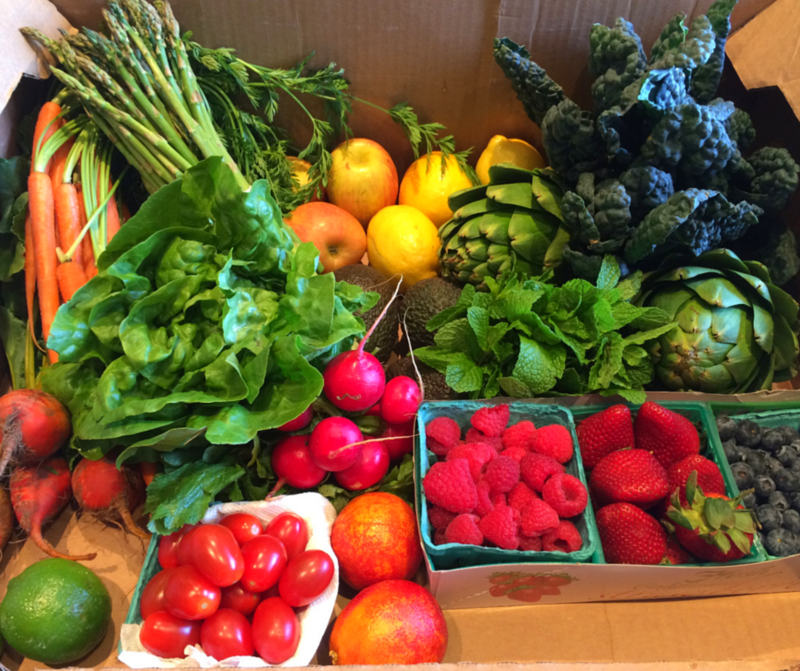 By the end of the day, the once empty box is overflowing with vegetables, fruits and other seasonal ingredients waiting to be made into delectable dishes. This Sunday was no exception. Like always, I put the ingredients to good use by testing out new recipes in addition to preparing some of my favorite meals. This week I made four dishes using my purchases from my trip to the farmers market along with other ingredients from my pantry. Before heading to the farmers market, check out what is in season here so that you can peruse the produce with ease. In addition, get more bang for your buck by purchasing items that are offered by a surplus of growers at the peak of their season. Once you have all of your ingredients, it is time to head to the kitchen! 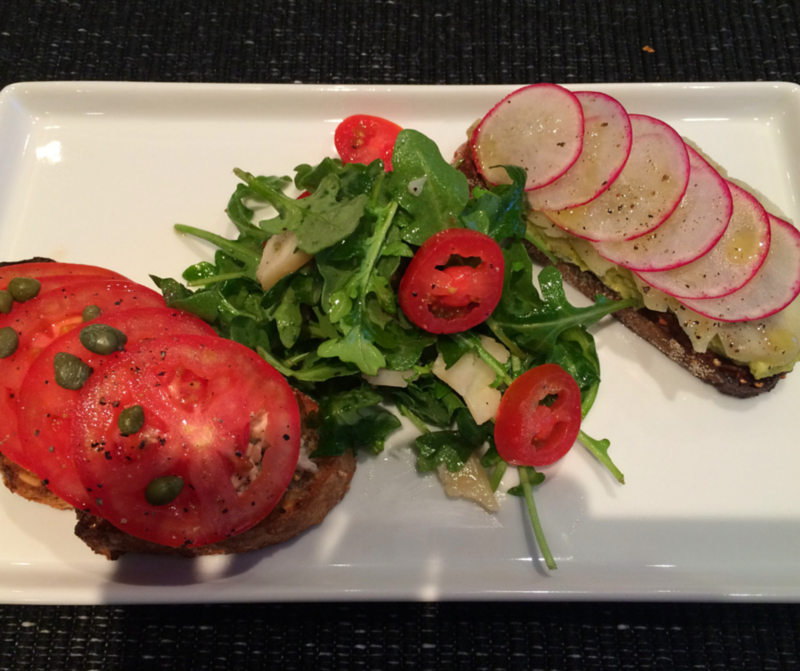 For my first dish, I created tartines, which are open-faced sandwiches, for a luncheon. On the left, the tartine consists of olive oil packed Italian canned tuna with cornichons, dill and lemon with capers and slices of tomatoes served on La Brea Bakery whole grain bread. 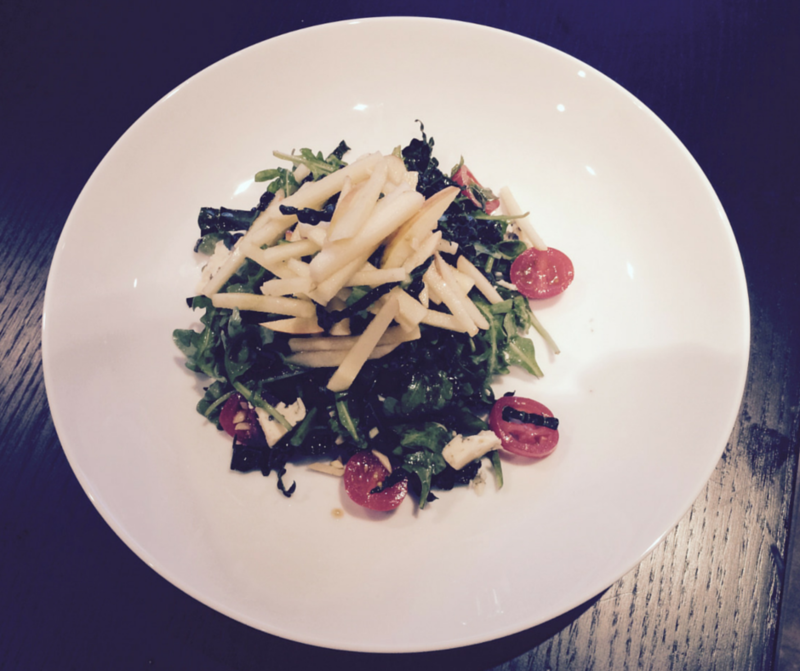 In the middle, I made a baby arugula salad with parmesan reggiano and a light lemon vinaigrette. On the right, the tartine is made with avocado hummus, marinated shaved artichokes, sliced radishes, and an artichoke vinaigrette also served on La Brea Bakery whole grain bread. For my second dish, I created a Tuscan Kale and Wild Arugula Salad with Fuji apples, cherry tomatoes, toasted almonds, Rogue Creamery Caveman Blue Cheese, and Bragg apple cider vinaigrette. All of the ingredients are organic, except for the cheese. I make sure to buy organic items whenever possible as long as the quality and flavor is excellent. 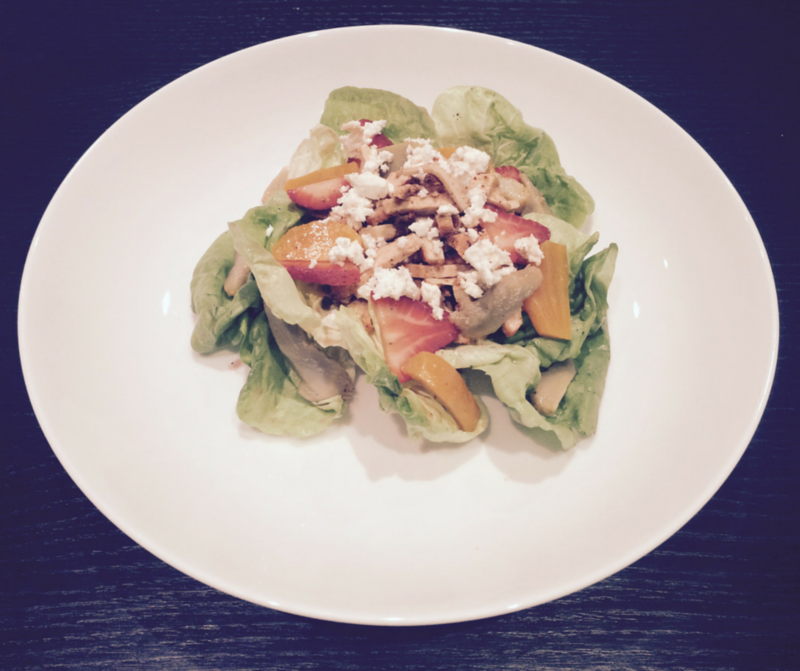 For my third dish, I created a grilled Yucatan-marinated Jidori Chicken Salad with butter lettuce, golden beets, artichokes, strawberries, Greek feta cheese, and a blood orange vinaigrette. All of the ingredients are organic, except for the cheese. For my fourth dish, I created crostinis, which are small pieces of toasted or fried bread served with a topping as an appetizer. On the top, I made a roasted asparagus crostini with a basil and white truffle oil infused ricotta cheese. 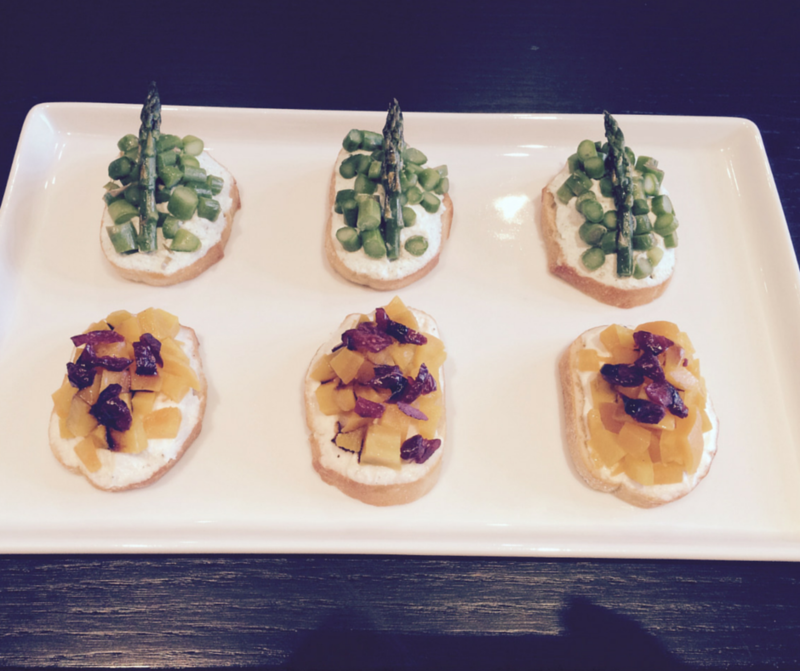 On the bottom, I made a marinated golden beet crostini with a goat cheese mousse with dried cranberries. With the help of locally-sourced ingredients from the farmers market, the Tartines, Tuscan Kale and Wild Arugula Salad, Jidori Chicken Salad, and Crostinis were flavorful and fresh! Whether you plan to entertain friends or family for an upcoming holiday or just for fun, the farmers market is the best place to go for all of your produce needs, and April is the perfect month to do so. Beautiful weather calls for beautiful dishes! For more inspiration, make sure to like my Facebook page and follow me on Instagram.